So here I am desperately trying to tie up a few loose ends. My last painting this year was one of the biggest I’ve done – using a full sheet of paper and with the framed picture in the region of three feet by two-foot six. Quite a challenge – no sitting down for this one! Again, based on some sketches done out on the Somerset Levels. Again, a gorgeous Autumn day, with too perfect a sky to begin with: the photos I took at the end of the morning at last yielded the bit of cloud you need for movement and brightness. At first I thought the view of Lollover Hill near Compton Dundon didn’t have enough in it to make a good picture. But I always make things too complicated and this time simplicity won out. The gateway was a gift for a focus, and the hill shapes and colours, especially the contrast between the shadowed and sunlit areas, gave me what I wanted. A very satisfying commission! So all I need to say is – Happy New year, all! 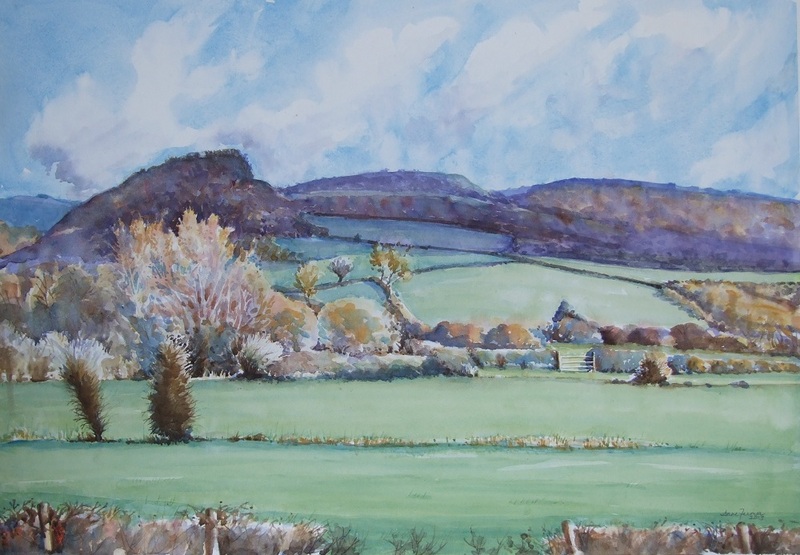 This entry was posted in Uncategorized and tagged art, Autumn, commission, Compton Dundon, drawing, Lollover Hill, painting, watercolour by anne farmer. Bookmark the permalink. I’ve sussed it. That is why your blog finishes in September 2012. You have two blogs. And if I may say, there is clear progress between the two. Thanks for calling by at mine. This lovely painting immediately caught my eye browsing wordpress reader.